Exploring numbers in different ways. Once we had played around with bead strings, we started adding other resources into the mix. I first saw these arrow cards more than a decade ago when I was doing work experience in a primary school. Basically, the cards stack in a clever way to align the columns and show what the digits in the place value system actually represent. Used in conjunction with other number representations, I think this is a really powerful tool. 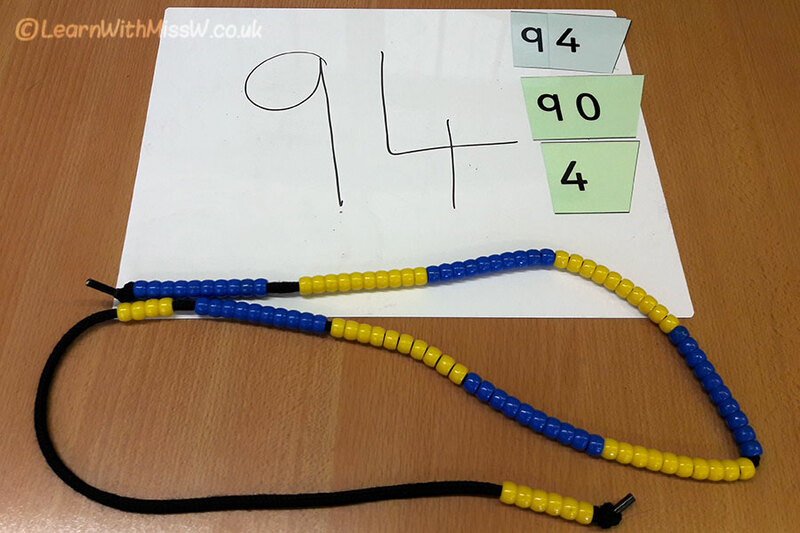 It helps children to see the different bits of the numbers, similar to expanding it into a sum, just in a different way. The arrow cards definitely showed up some misconceptions. On our first attempts we had digits such as 9 and 4 being put together, missing the point that we’re using the quantitative model of number, making 90 first then adding 4 more. Making a few sets of these cards is no small undertaking, especially if you aspire to make them into the thousands! I have 5 sets and as much as I’d like more, that was definitely enough. Some downloadable templates work, others don’t. I found that out the hard way (don’t ask).